November is National Adoption Month and last Sunday, November 3rd, was Orphan Sunday. Some of you who attended church Sunday probably heard an amazing message and/or saw some incredible stories about orphan care, adoption, foster care, or respite care. Some of you who attended church heard absolutely nothing about any of the above. A vast majority of you probably experienced something in between--something along the lines of "There are orphans in the world. Let's love them." Or you saw pictures of adorable and filthy little faces staring deeply into the camera. Some of the kiddos might have seemed like they were staring into your soul saying, "PLEASE ADOPT KIDS LIKE ME," but most of you might have been left wondering, "Do we all have to adopt in order to help? I am not ready/able/called to adopt. How am I supposed to love orphans with this being the case?" If you are someone who experienced the questions above, this post is for you. Adoption isn't for everyone, only the truly awesome. Adoption isn't for everyone, and we don't think we are special or extra-awesome just because we feel called to it. The truth is, not all of us are called to adopt, and that's ok. However, all of us who call ourselves Christians are called to care for orphans (widows, too...but that's another post for another day). Some are called to adopt (and if you are, then do it already, by golly! ), some are called to support people who adopt, and some are called to support orphans physically, emotionally or financially. World Vision -- You can sponsor a child or select from a wide range of gifts (live animals, anyone?). Honestly, there are so many ways to get involved that you almost need to just visit their site to see it all! Also, they are now working in Congo, so you can go here for more details on that venture. Generation Next (links to Twitter account) -- I just bought this shirt for $15. 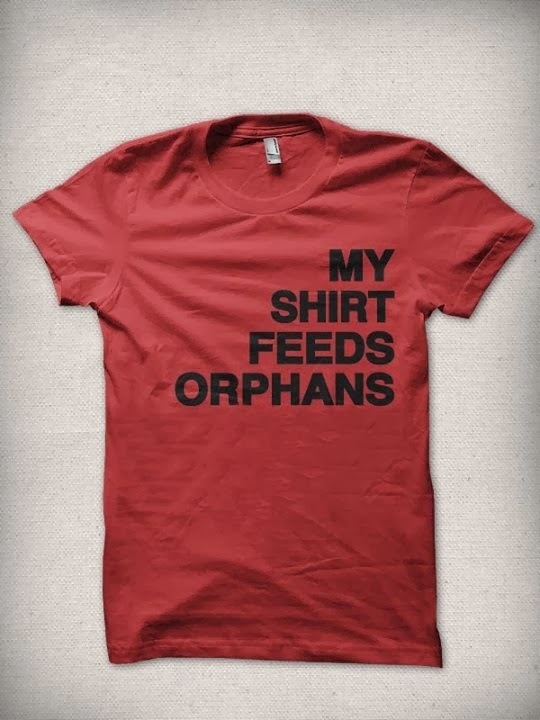 If you want one, email Riley (a student at my school with a heart for orphans who is doing amazing things. Her email is Africa.bound@hotmail.com. This organization provides school supply backpacks and hygiene backpacks for children around the world (mostly Africa). You can read more about Generation Next here. So inspiring! Bring Love In -- "Creating new families from widows and orphans in Ethiopia." This organization helps place truly orphaned kids with widowed women, who can then become mothers to the orphans. Cool, huh?? You can also sponsor their "Keep one home" initiative to help prevent children who are at risk from being orphaned. This non-profit comes alongside families who are living on the financial brink and supports them with resources needed to keep families together. "As much as we love creating new families, we feel that there will never be a family like the one you were born into. Convoy of Hope -- One of my favorites, possibly because they are near us, but also because they do so much good in the world. This would be a DREAM JOB for me, too. Convoy has "a driving passion to feed the world," and they specialize in children's feeding initiatives, disaster response, and community outreach. Mercy Branch -- A new ministry with a "passion and heartbeat for serving and discipling the 150,000 children living on the streets of Addis [Ethiopia]. We are burdened for these children, and are seeking to extend the gospel and mercy of Jesus to them." Project Hopeful -- Provides support to parents of children with HIV/AIDS. "Every orphaned child hopes for a family and a home. The reality for many children with HIV/AIDS and other special needs is that the chances of having that dream materialize are slim. Time and again, Project HOPEFUL has witnessed that with education, encouragement, and assistance families and individuals can be enabled to advocate for and adopt overlooked children." Rafiki Organization -- Rafiki established 10 villages in African countries to "provide orphan care, Bible study, classical Christian education, and teacher training through Rafiki’s five programs: ChildCare, Education, Rafiki Bible Study, Advanced Learning, and Widows." Some other orphan-loving organizations I love: Lifesong for Orphans, 147 Million Orphans, Show Hope and, of course, All Blessings International. Looking for even more tangible ways to support orphans, adoptive and foster families? Take a gander at this blog post from Katie Mohr. PLENTY of practical options from which to choose. Have more ways to help? Comment below! !